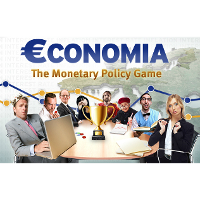 ECONOMIA – The Monetary Policy Game is a game created by European Central Bank in which players have to take part in the monetary policy making process. Decide key interest rate and check indicators (money growth, inflation rate, production growth etc.). Keep average inflation rate right below 2%. Keep variations in inflation on low level. Created to teach Europeans what monetary policy is. Education in economics and monetary policy. Players learn about indicators that make the economy and monetary policy stable. Players train in decision-making process. Players can read most important pieces of information about monetary policy and its indicators in the glossary. Hello, €conomia doesn’t fonction on our website, what could I do ? Hello! European Central Bank seems to have some issues with their website. We will reach out to them and let you know when it’s up-and-running again!